I just completed a â€œrefreshâ€� of a really sluggish starter on my 82 Aspencade. It was sluggish at times (more times then not) and would sound like the battery was going dead. It would draw so much current that I lost my radio presets a few times. My battery is in good shape and seems to test fine on a stress test. I had a golden opportunity to do this refresh as I was doing other work to the bike and the exhaust was off. I was staring right at it. Itâ€™s done and WOW! What a difference!! Not a hard job, no money involved for me, just my time. Hereâ€™s what I did. First thing to note is that the bike was on the center stand. Some people say yes to this and others say no. My recommendation would be to have the bike on the center stand. This can be done with the exhaust system on but I am glad mine was off. I donâ€™t think there would have been an issue with it on, just a bit more wrangling to get your hands in there. VERY IMPORTANT â€“ Remove the battery from your bike or at the very least disconnect the positive (RED) lead from the battery and TAPE it back so it canâ€™t spring back to the battery post. No one wants a lead acid battery exploding in their face from a dead short! Safety comes first. Remove the power cable that goes to the starter. 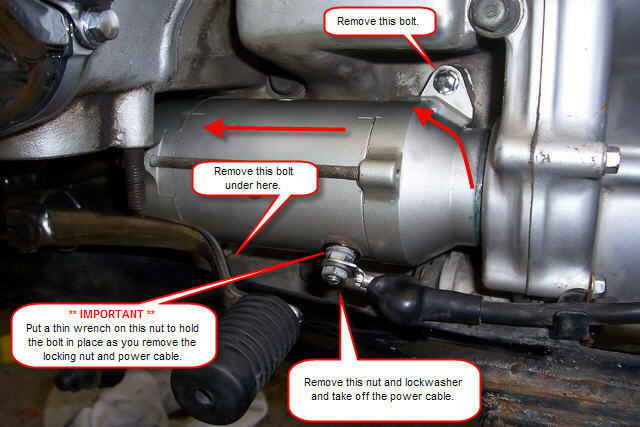 VERY IMPORTANT - Make sure you use a thin end wrench to back up the lug when removing the nut from the positive lead. Ifthat bolt starts to turn it may sever the conection internaly and the starter may have to be replaced. Remove the two bolts that mount the starter to the engine. Pull back the freed starter while wiggling it. 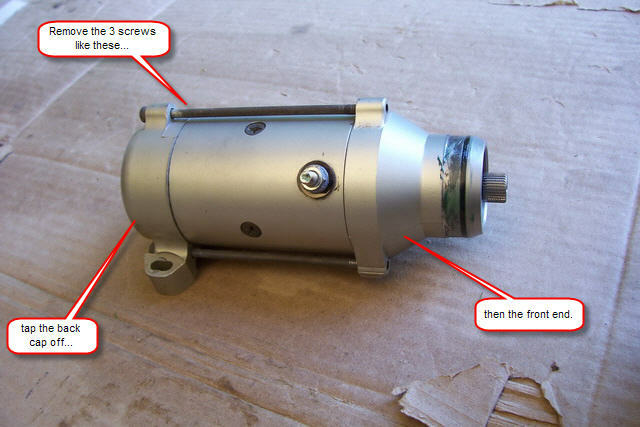 When it is free from the engine, tilt it out and up until the starter shaft clears the engine and remove the starter. You may have to push down on the gear shift to gain a bit more room. This is the mounting hole once the starter is removed. 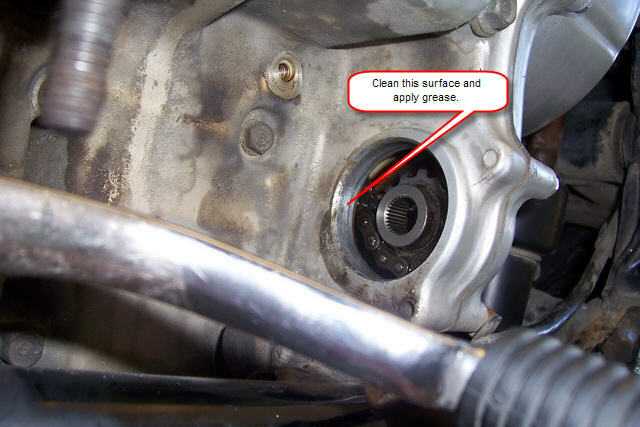 Clean the mating surfaces where the starter will go back in. Put a very thin film of grease here. Note how the cog and starter chain looks just for a mental reference during the re-mounting of the starter. Remove the 3 long screws and tap off the back end first and then the front end. It will be messy with carbon on one end and grease on the other. This is the Front End. 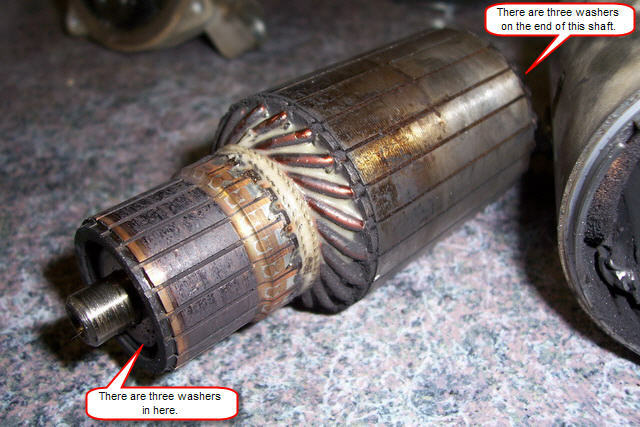 This is where the reduction gears are and is packed with messy stale grease. We will come back to this part later. Set the front end aside for now. This is the Back End. 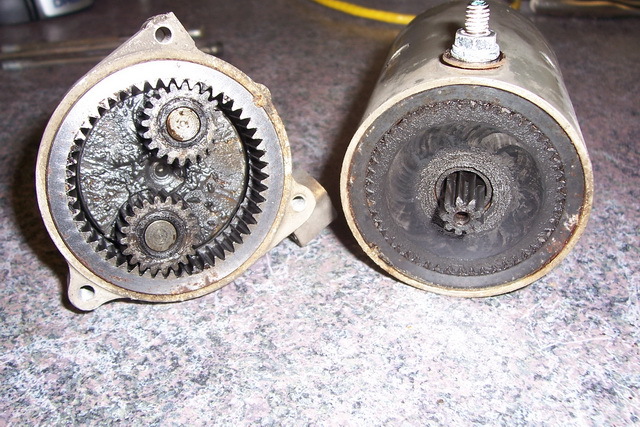 This is the business side of the motor that most of your problems will be coming from. Note the amount of loose carbon just floating around in there. 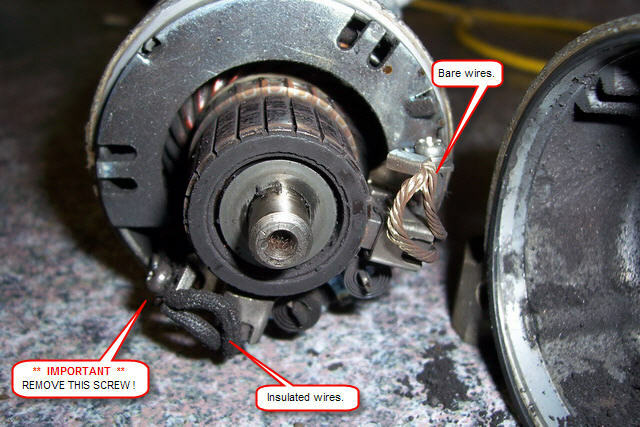 Also note the condition of the commutator on the end of the armature. All that old carbon and the debris piled up here is where the majority of you starting amps go. It has to fight through the conductive crud to make good contact to start the motor moving. 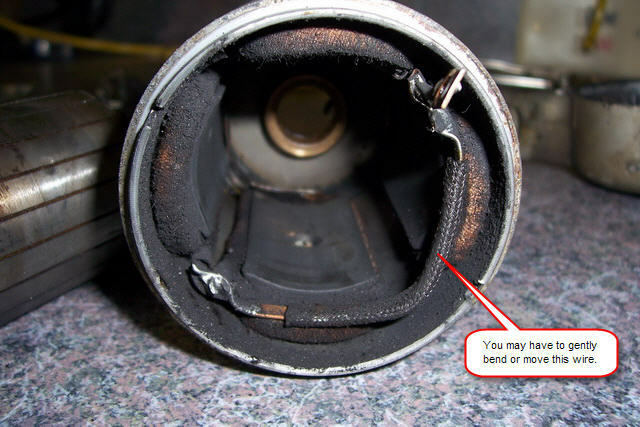 Remove the thin, delicate rubber gasket and clean it. Set it aside as you will not need it until the end. This is the End Cap after cleaning. It was cleaned in Mineral Spirits, washed in hot soapy water and then blown dry. 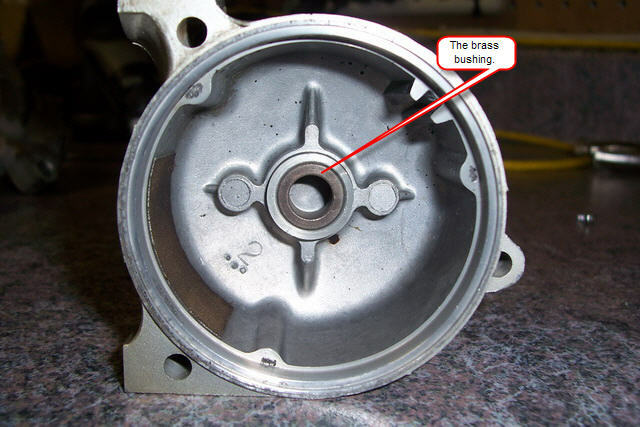 Make sure you get the crud packed in behind the brass bushing. You donâ€™t remove the bushing and the bushing does not seat all the way down the bottom of the flange. Next the Brush Cover has to be removed. VERY IMPORTANT â€“ Remove the screw from the + side of the brushes as shown in the picture. 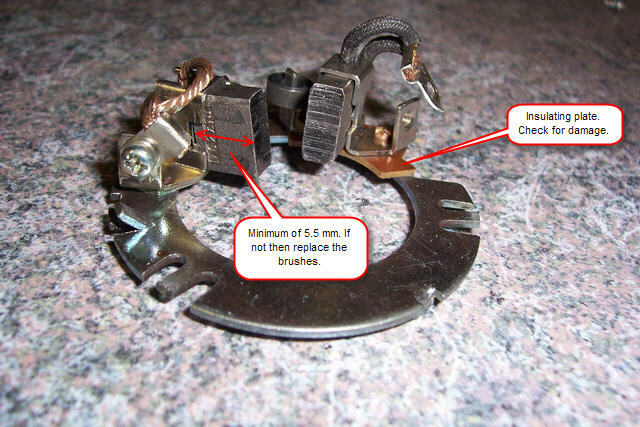 Hold the screw mount with your fingers as the torque from the screwdriver may break the insulator below. If this screw is not removed you will break the insulator and have to buy this whole Brush Cover assembly. The + side has the insulation on the actual brush wires and is connected to the wire that goes down into the starter housing. 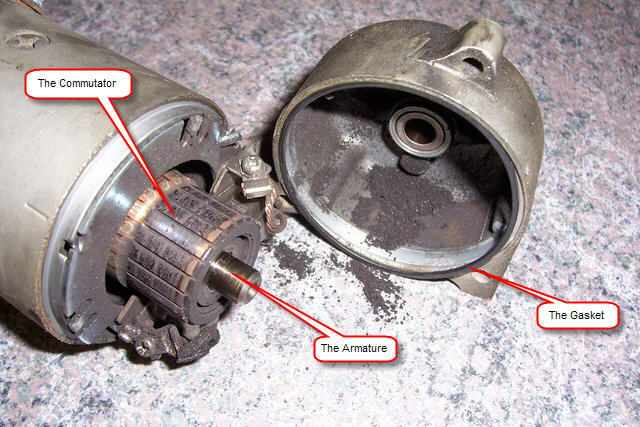 Remove the Armature from the Starter Housing by gently pulling it out. You may have to gently move the wire to the side to pull the Armature out. Be carful not to damage the insulation on the wire. Remove the washers, clean them and set them and the Armature aside for now. Weâ€™re going to cleaning the Brush Plate now. This is somewhat delicate work. Use Isopropyl Alcohol to clean this item. Donâ€™t use any solvents. You donâ€™t want anything soaking into the Brushes. They are porous material. Use the alcohol and a tooth brush to clean it with. Blow dry it gently. Measure the Brushes. If they are below 5.5 mm in length then they need to be replaced. Check the insulating plate for damage.